You were the first guy to enter the hallway with your Glock in the Sul position. 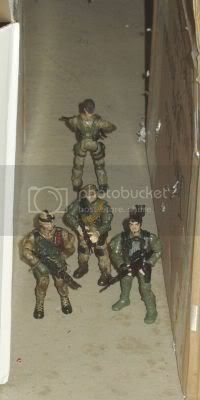 As you entered the hallway had you seen anyone you would have made a heartbeat decision as to whether or not they posed a threat. The odds are they wouldn't pose a threat and at that time you would yell Building Security please return to your rooms immediately! 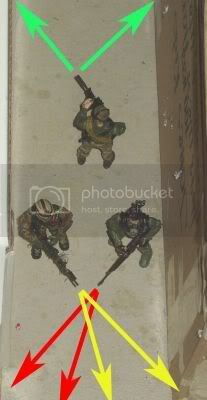 As your team mates enter b they take up their security positions. Notice that the whole hallway is covered. 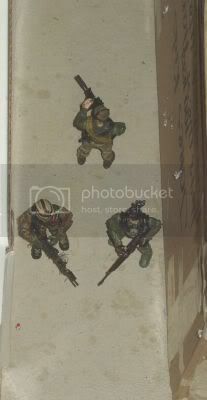 The team can move like this with relative security but hallways are dangerous places to move as EVERY door, window, coke machine, table, air-conditioning vent, etc. is a danger area. You MUST think in terms of a 360 degree hostile environment. Ceilings, walls, floors, front and back. Continuously scan these areas within your Sector of Fire. 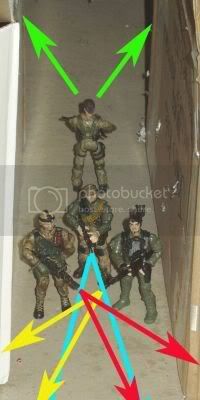 You pretty much wait by the front door covering the hallway until the whole group is there then you will assemble into the 4 man hallway security formation. It looks like this: (Be advised that the women and children are in between the 3 man group and the 4th man. You will be continuously communicating to your team-mates b and they to you. Moving Closed door right Coke machine left etc. ANYONE can stop or halt the movement by saying Stop then communicating why. If you are searching for bad-guys - movement will be slow and deliberate a few feet per second is a good rule of thumb. However in this instance you are just looking for a safe room and can move quicker. In a b textbook building clearing you NEVER pass by a door that you haven't cleared that room. However in this case you are not searching for bad guys you are searching for a safe place to hide out. So you won't be taking the time clear the whole dang building. You will pick a room and then clear it. You are obviously wanting to pick a room that allows good security and a 2nd way out and one that provides good avenues of fire should that become necessary. I would avoid 2nd floor (or higher) rooms as riots tend to burn buildings down and it would be poor form to be stuck on the 2nd story of a building when it is on fire. Although from a security standpoint the first floor is the LEAST secure. As always there are trade-offs and compromises to be made. The choice is yours and your team-mates. Go with what you feel is best for the given situation and adapt and overcome obstacles when they present themselves. Once you locate what you think would be a good room the three of you would stack outside the door and the fourth man would provide rear security.